A product of a one night stand, abused in foster home after foster home, and raised sleeping in parks were just a few of the daunting obstacles in Monti’s journey from the streets to the stage. This is an interactive presentation, designed to help students gain the problem solving skills needed to be successful, both inside and outside of the classroom. 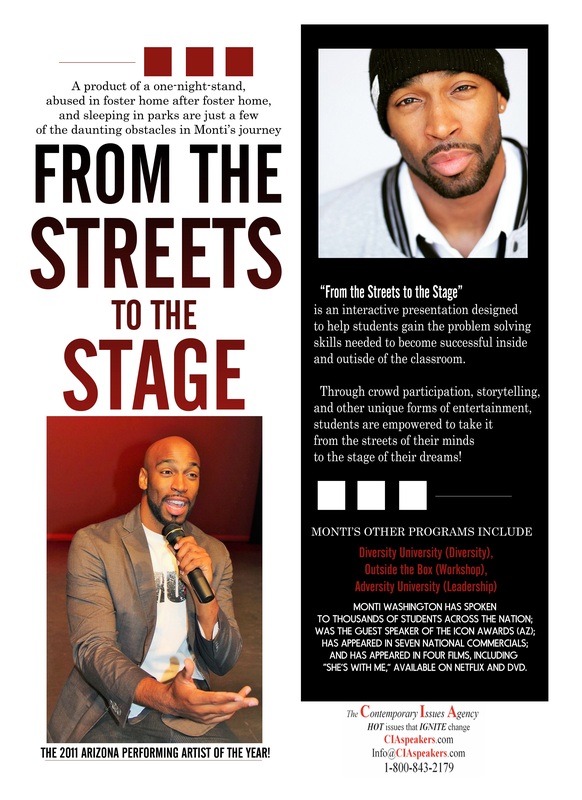 Through crowd participation, story telling, and poetry, students will be engaged, encouraged, and empowered to make it from the streets of their minds, to the stage of their dreams. CLASS IS NOW IN SESSION! The ability to handle adversity on College & University campuses is essential to being the best campus leader possible. Monti Washington A.K.A “America’s Adversity Coach” teaches students how to TURN ADVERSITY INTO SUCCESS! Adversity University is an interactive keynote designed to help students develop the leadership, problem solving, & creative thinking skills needed to be successful in and out of the classroom. Through storytelling, crowd participation activities, and a uniquely entertaining approach, students will see how adversity can be used to make them better leaders in the classroom, on campus, and in life. Monti was great and exceeded my expectations. I enjoyed working with your agency, and hope to do so in the future. Just wanted to thank you Monti for a fabulous assembly at Westview. The students and staff really appreciated your story, quick wit and enthusiasm. Speaking in front of 2500 students and keeping them engaged is no easy task…but you have a gift. Looking forward to your return next year! Thank you very much Monti for presenting at my school. I appreciate your ability to inspire not only my students and I, but also my colleagues! I will be spreading the word of your talents and abilities to all who will listen. Thanks for being you! Wednesday with Monti went great. He was polite and friendly. Monti was awesome at going with the flow with the changes in our itinerary. He gave an amazing performance which touched many hearts in the audience. I am really grateful to have been able to work with him and you.